The possibilities of the voice: A cappella choral music is once again one of the booming branches of musical life. This is due on the one hand to the curiosity of choirs in an internationally-linked and highly-motivated choral scene, and on the other to the fact that mostly younger composers are again discovering the charm of the human voice, with its many-faceted expressive possibilities. 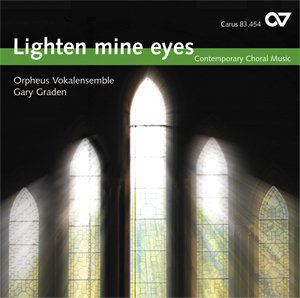 Here the Orpheus Vokalensemble, under Gary Graden, present various choral works from Germany, Scandinavia, and the Baltic states. Whether pure sound or pure rhythm, musical amplification of the language or the simulation of synthesized sounds, the lively contrast or the discreet changing from tradition to the modern, whether Buchenberg or Nysted – characteristic of and representative of contemporary choral music is its wide-ranging diversity.